Looks like Facebook is slowly treading onto Uber's turf. 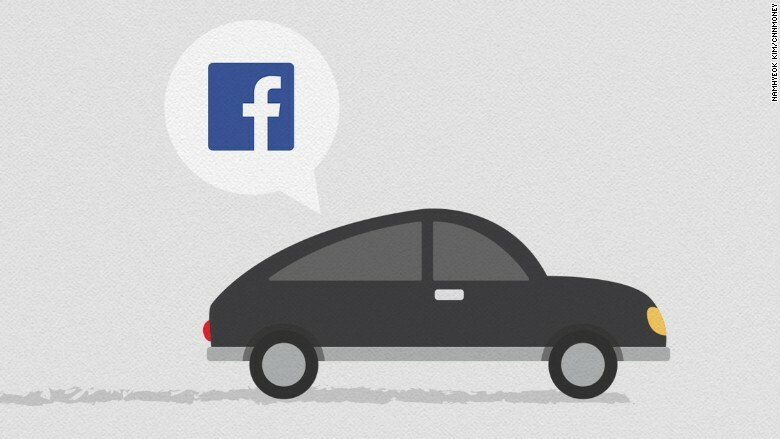 A patent application published Thursday reveals that Facebook (FB) is looking to get into ridesharing. People are already accustomed to creating, discovering and RSVPing to events on the social network. But Facebook's event feature could soon get even more useful: The company is looking to help users share cars, or find a travel buddy, to get to those events. When RSVPing to an event, users might be prompted to give more specific responses, like "Going and driving" or "Going but not driving," according to a diagram in the patent application. 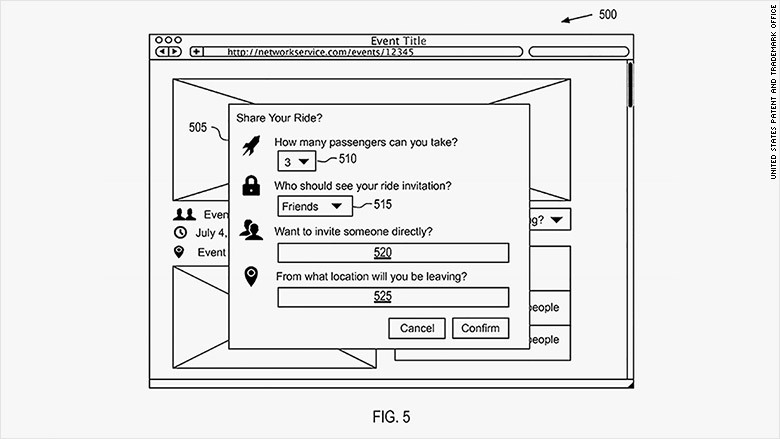 Diagrams from Facebook's patent application reveal what the event-based ridesharing for users might look like. "Matched users are able to benefit from cost-effective, environmentally friendly, and/or social aspects of sharing transportation to the event," the document read. It could also take into account similar interests in music, politics and even restaurant preferences. It's clear that Facebook has been thinking about ridesharing for some time: The application for the patent was filed in July 2014. Patents typically remain confidential for 12 to 18 months after being filed before the U.S. Patent and Trademark Office makes them public. Facebook's patent is not yet approved, but is still in play. Last month, the company announced a partnership with Uber that would allow users to book a car from Facebook's Messenger app. At that time, Facebook said it hoped to add other Uber-like services in the future. The company has been looking to increase the utility of its platform and give users a reason to stay on the site -- from piloting live video streaming to making it easier for people to donate to charities. It isn't the only social network to make its platform an all-in-one destination. Chinese messaging app WeChat, which has 600 million monthly unique visitors, has integrated everything from charitable giving to food delivery into its platform. The story was first reported by Quartz. Facebook did not immediately respond to requests for comment.